Inside you'll find recipes that are simple, yummy, and green. 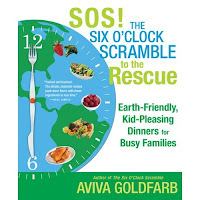 Although most cookbooks I check out from the library are not worth buying (I always try before I buy), The Six O'Clock Scramble was a huge hit at my house, and I ended up purchasing my own copy. So when I heard that there was a new "Earth-Friendly" Six O'Clock Scramble! Cookbook , of course I wanted to try it! Kid-pleasing recipes that have fewer than 10 ingredients and take 30 minutes or less to prepare. These recipes make eating out less and eating in more doable for even the busiest families. Side dishes for each main dish included too! Recipes are organized into Spring, Summer, Fall, and Winter and focus on seasonal ingredients. Lists of healthy snacks and lunches you can easily prepare at home. Weekly menus so you only need to shop once a week (you can find weekly grocery lists for all the recipes in both cookbooks at http://www.thescramble.com/). A generous portion of the proceeds are donated to the Environmental Working Group. I love EWG! Practical tips on gardening, composting, reducing your overall waste, and avoiding toxins in food and food packaging. Reasons for eating local and organic foods and how to do it. Parent-tested tips to get kids to embrace new foods and recipe adaptations for picky eaters. Ideas for healthier and greener holidays. Mumbai Meatballs with Yogurt-Chutney Dipping Sauce. Delectable, added to my regular rotation. Savory Mustard Salmon. Pretty good and very simple, might make again. Baked Risotto with Spinach and Cremini Mushrooms. Pretty good, but not worth the effort to me. Won't make again. Spinach Pie with Portobello Mushrooms. Just OK, but user-error involved (I used 16 oz of frozen spinach instead of 10 oz), might try again. Far-Out Chicken Teriyaki. Easy and super delicious, added to my regular rotation. Mini Meatloaf Muffins. Cook in half the time compared to regular meatloaf. I made it with ground turkey and have added it to my regular rotation. Miraculous Macaroni and Cheese. You don't have to cook the pasta first, but since my kids weren't that into it, I probably won't make it again soon. Delectable Sweet-and-Sour Tofu. Good, even with substitutions (because I didn't have all the ingredients on hand), will try again. I also really love the organization of the second cookbook . Goldfarb must have incorporated lots of feedback from her readers and subscribers. I love the detailed tables of contents and indices that make it so easy to find a recipe by ingredient (poultry, pasta), by preparation plus cook time, by preparation options (slow cooker, freeze ahead) or for a specific occasion (potluck, picnic). One more thing you should know: In addition to writing cookbooks , Aviva Goldfarb runs a weekly online meal planner. You can tell that her cookbooks are informed by the experience of her online subscribers who provide feedback about the recipes. Real families for recipe tasters! I have not tried the service, but if you are interested, sign up before January 31 and receive $4 off all 6 month and 12 month subscriptions (or just $25.50 for 6 months, or $50.50 for 12 months). Just use the promotion code NEWYEAR2011 at check out. Check out a sample menu plan for the service HERE. I recommend you check out a copy of either Six O'Clock Scramble cookbook at your local library and try some of the recipes. Note that the cookbooks are not filled with gorgeous photos, which probably helps make them more affordable. You can find one of Goldfarb's recipes in this post and more (less well-tested) recipes on Goldfarb's blog, if you want to see if her cooking style fits yours. Full disclosure: I received one free copy of SOS! 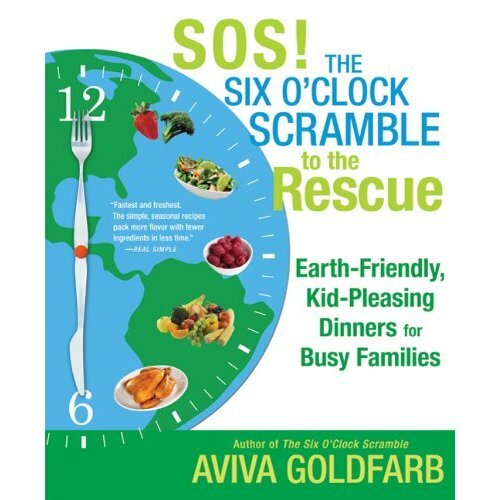 The Six O'Clock Scramble to the Rescue: Earth-Friendly, Kid-Pleasing Dinners for Busy Families to facilitate this review. All opinions my are own. If I hadn't liked the cookbook so much, there'd be a giveaway in this post. But I do like it. A lot. So I'm keeping it. Read my full disclosure policy here. Looks good. I totally idenitfy w/that "6:00 Scramble!" I'm gonna look this one up!